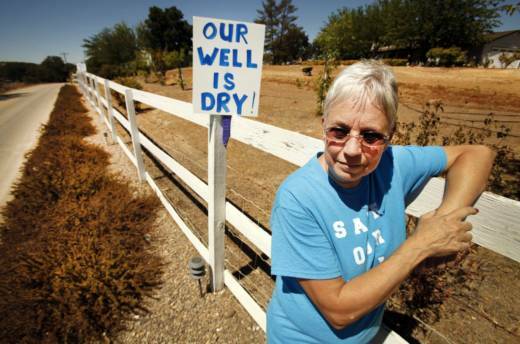 California is well behind the curve on groundwater regulation. With a few exceptions, groundwater extraction has never been regulated in the state or even monitored with any precision. However, a 2014 law, the Sustainable Groundwater Management Act (SGMA), at last will require groundwater basins in the state to reverse longstanding overdraft problems. This will mean metering individual groundwater wells for the first time, as well as collecting fees from groundwater users to fund management efforts. Most western states started down this path decades ago. So to help inform the nascent effort in California, Environmental Defense Fund and the Daugherty Water for Food Global Initiative examined groundwater management programs in six states. Their new report illuminates lessons from Arizona, Oregon, Colorado, Texas, Nebraska and a few pioneering groundwater managers within California. Water Deeply recently spoke with Christina Babbitt, a coauthor of the report and senior manager of the Environmental Defense Fund’s California groundwater program. Water Deeply: Why did you do this study? Christina Babbitt: We really did the report to better understand some of the challenges that water managers are facing across the West, and the tools and strategies they’re using to address these challenges. We think that by better understanding what others are doing across the West, we can leverage those lessons learned to inform water management under the Sustainable Groundwater Management Act here in California. By looking at some of these innovative approaches, we can give water managers hope in California that they can meet these difficult challenges that lie ahead of us. The weather this winter is yet another reminder of why California needs a safe and resilient water system. And groundwater plays a really important role in that. Water Deeply: What were your main findings? Babbitt: The most effective groundwater programs had five key elements: trust and community involvement, accurate data, a portfolio of approaches, performance metrics and access to adequate funding. Building trust is key. It emerged as something that is needed, but is something that is often overlooked when developing successful groundwater management programs. And trust really began by having broad community involvement. Water Deeply: How should groundwater agencies go about building trust? Babbitt: That is something we can’t stress enough in SGMA implementation. One way is to use data to build trust. So for example, in the Kings Basin in California they’ve been using these data-driven groundwater models to convey what is happening with groundwater so people can start to buy into what is happening within the basin. Also you can build trust by including stakeholders in the planning process from the very beginning, so they know how management is evolving and what information goes into making decisions. In Nebraska they’ve done a lot of outreach and engagement and they are in charge of more than groundwater – for example, soil management and land conservation. It allows them to communicate and interact with the community in ways that are not always regulatory, which I think is a great way to build trust. Water Deeply: What do you mean by ‘broad community involvement,’ and why is that important? Babbitt: I think this broad community involvement needs to be from a diversity of voices, so it’s not just one sector making all of the decisions. All the interested stakeholders need to feel they have a voice at the table. And it’s not only a voice. They need to feel their voice is being considered by decision-makers. If that’s not done at these early stages of development, it’s going to come back and be detrimental. And there’s a huge educational component that goes along with it. There are a lot of people who depend on the well they might have outside their house. They need to understand why they should be interested in participating. That’s a responsibility of the folks who are making the decision to really reach out and be inclusive in the process. Water Deeply: The report also mentions the importance of patience. But it’s not one of your five key elements. Babbitt: Successful groundwater management is not something that happens overnight. It takes all of these five elements and it also takes a huge learning curve. It’s a process of evolution. It’s interesting. I think when SGMA was first passed, a lot of the deadlines for achieving sustainability seemed really far off. But if you’re in a high-priority basin, you have to develop a sustainability plan by 2020. And that’s right around the corner. That’s not going to be easy with the challenges many of these areas are facing. Water Deeply: You examined policies in six states, all of them in the West except for Nebraska. Why Nebraska? Babbitt: I’m a bit biased because I did go to school at the University of Nebraska. But Nebraska is a state that’s dominated by irrigated agriculture. And I think 91 percent of the state’s total land area is dedicated to agricultural production. So they have a lot at stake when it comes to groundwater, and we can learn a lot from the things they’ve done. Nebraska has implemented a portfolio of approaches to manage their groundwater, including regulations, incentives and outreach programs. Some highlights from what they are doing really well are emphasizing public education and outreach to make sure water users and community members are informed. They have established a really interesting system for capping the number of irrigated acres that can be allowed, and a way to allocate water among individual users. It provides much-needed certainty to growers, but also allows itself to adapt to changing conditions. Water Deeply: What kind of data is needed, and how is it used? Babbitt: People are going to need to show why and how they are making decisions. And I think data is a key piece of the puzzle when it comes to building some of these incentive-based programs. For example, if you want to look at the Edwards aquifer [in Texas], they have implemented a system that allows them to trade pumping permits. It’s essentially a trading market, and you need a certain amount of data to be able to implement that program or to incentivize some of these mitigation programs. It really must be a portfolio of approaches. You can’t just have regulation. You can’t just have education and outreach. It really is many things that have to come together.